The secretary of state has been accused of having no new ideas to restore devolution after a round of talks with four of the main Stormont parties. The possibility of resurrecting the talks process was discussed when the parties separately met with Karen Bradley on Monday. The assembly has not sat for 20 months. Sinn Féin's Michelle O'Neill said the meeting was "more of the same" while UUP leader Robin Swann described it as "depressing". SDLP's Nichola Mallon said it was time the British government "stood up and ended the drift". Alliance deputy leader Stephen Farry said it was "incumbent upon all the governments to really energise a process over the course of the autumn" and again called for an independent mediator to be appointed to oversee talks. The purpose of the meeting was to talk about Mrs Bradley's proposals to bring forward legislation to allow civil servants to make decisions in the absence of devolution, but possible future talks to restore Stormont were also discussed. Following the meetings the secretary of state said she was "determined to deliver" devolved government. "Last week I set out the Government's clear plan to bring that about and today was the first step in that process," she said in a statement. "I will continue engagement over the next days and weeks ahead of legislation to support the ongoing delivery of public services in Northern Ireland." Michelle O'Neill said Sinn Féin's meeting offered "no more detail in terms of the (talks) process" and accused Mrs Bradley of "pandering". Image caption Michelle O'Neill said the meeting with Karen Bradley was "more of the same"
"What Karen Bradley has done today is more of the same of what she's done over the course of the last 18, 19 months - she's pandered, she's talked up the fact that they have a priority to restore the executive however she has failed to bring forward any proposals in which to be able to do so," she said. Mr Swann said he was "underwhelmed" by the UUP meeting. He added: "The opportunity for a talks process starting now or in the near future is very slim from what we're actually hearing today." Mr Farry said there was a "real essential requirement" to appoint a mediator to oversee a new talks process. "That in itself isn't going to crack it, but it will make a world of difference in terms of the dynamics and to avoid people from wriggling away from their responsibilities." Ms Mallon said there was "no impetus coming from the DUP and Sinn Féin to get devolved government back up and running". "That's why we have consistently said as co-guarantors of the Good Friday Agreement there is a responsibility on both governments to live up to that duty. "If they remove the obstacles, they remove the excuses and we can get back around the table and doing the job we were elected to do." The parties also discussed Mrs Bradley's proposals to bring forward legislation to give civil servants with more flexibility to legislate while Northern Ireland remains without a government. Unelected Stormont officials had been taking some major decisions normally reserved for ministers, but that all changed following an unprecedented court case in May. A judge ruled that the Department for Infrastructure's permanent secretary did not have the power to give the go-ahead for a controversial waste incinerator plant in County Antrim. Last week, the secretary of state announced that assembly members' pay will be reduced in stages from £49,500 to £35,888, with the first cut due in November. Mrs O'Neill said some of the measures announced by Mrs Bradley, including cutting MLAs' pay, were "overdue" but said others were "clearly undemocratic in nature". Image caption Ulster Unionist leader Robin Swann said the meeting with the secretary of state was "completely depressing"
Mr Swann said "there's no bite" and "no detail" to the proposals and that his party "didn't see any direction as to where decisions are going to be made or what they're going to be made about". He said some outstanding decisions - such as the approval of a suicide prevention strategy, a decision to bring public sector pay in line with the rest of the UK and the approval of recommendations made by the Historical Institutional Abuse (HIA) inquiry - would not be made under the secretary of state's proposals. The DUP is expected to meet Mrs Bradley in London on Wednesday as its leader, Arlene Foster, is currently in Gibraltar. Northern Ireland has been without a devolved government since January 2017 when a coalition led by the two biggest parties, the Democratic Unionist Party and Sinn Féin, collapsed after a row over a flawed green energy scheme. The row led to a snap assembly election on 2 March 2017, which saw the DUP and Sinn Féin re-emerge as the largest parties. There have been several rounds of failed negotiations and the parties have so far been unable to reach a deal to restore the institutions. 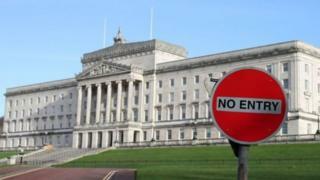 Stormont stalemate: Who's calling the shots on policy?